The Mac hasn’t exactly been inundated with commercial massively multiplayer online games (MMOGs) over the years. Blizzard Entertainment’s superlative World of Warcraft was the last big one, and that debuted in 2004. EVE Online is an MMOG of a very different color, and if you’re looking for a game with incredibly deep and challenging game play, this is it. 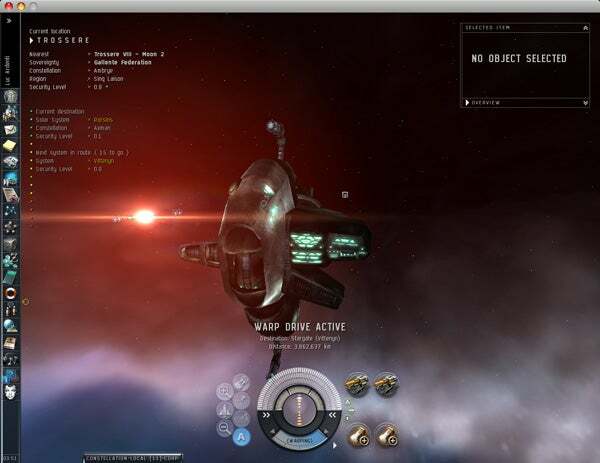 EVE Online makes World of Warcraft look like Minesweeper. EVE Online has been a phenomenon on the PC since 2002, and has developed a small but incredibly loyal (and growing) base of subscribers since then. CCP Games, the game’s developer, has been constantly refining and improving the game since its debut, and has finally turned its attention to platforms other than Windows. 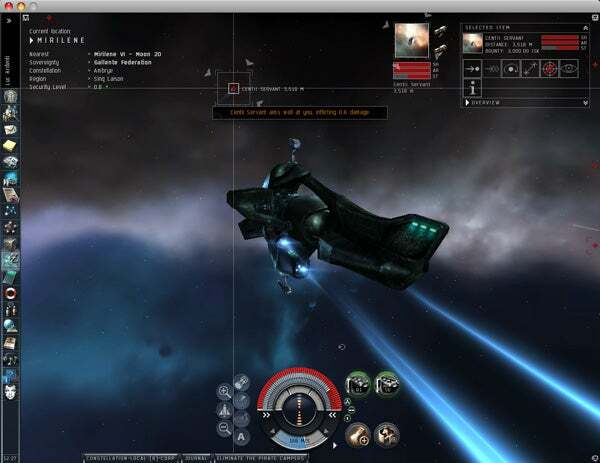 In 2007, CCP partnered with TransGaming to bring EVE Online to Intel-based Macs. And the result is absolutely spectacular. So what is EVE Online? Superficially, it can be described as a space trading, exploration and combat game. You spend your entire time encapsulated in a spaceship capable of interplanetary flight, traveling from space station to space station. This will sound immediately familiar to Mac users who whiled away many hours playing the addictive Escape Velocity games from Ambrosia, and there are some comparisons. Both games owe more than just a nod to Elite, considered by many to be the great-grandaddy of space trading games of this ilk. It’s the Economy, Stupid EVE Online isn’t just about flying around in space. 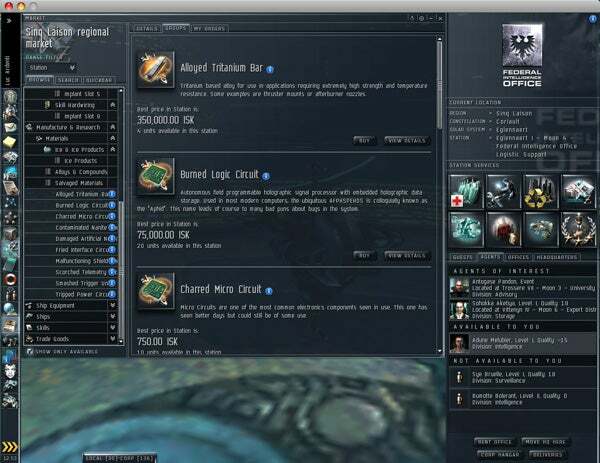 You also can track economic trends, making money buying and selling goods, manufacturing and inventing. It’s really the ultimate “sandbox” experience for online gaming—you can, if you wish, become a cargo pilot, shuttling vast quantities of material from system to system; a miner, extracting ores from asteroid belts, strip-mining entire systems of their precious metals; a battleship commander, sending swarms of fighters into battle in massive fleet attacks; or a pirate, hitting individual players, raiding their goods and leaving in a hurry. But you don’t need to be a space pilot to succeed at EVE. You can also train to become an inventor or manufacturer of goods, selling precious items to the highest bidder. You can create a Corporation—the EVE Online equivalent to a World of Warcraft Guild—a collection of like-minded players with similar goals and aspirations—and you can basically run your game from behind a desk. The depth and breadth of EVE is really staggering. For more information on the ins and outs of EVE, check out my newbie’s guide to the game. Sunset in Space EVE Online’s visuals are stunning, such as this solar glare visible as this spacecraft warps away to its next destination. EVE Online is also a phenomenally pretty game. As you fly from system to system you’re almost overwhelmed with glowing nebulas, the flare of far-off stars, the giant rings of nearby gas giants. There’s a lot to look at in EVE, too. And it’s going to get even prettier with a new upgrade called Trinity that’s coming out for PC users later this year, and for Mac and Linux users in early 2008. Zeroing in for the Kill Honing your combat skills is an important part of the EVE Online experience. Is the Mac conversion perfect? I’ve spent less than a week with it, so I’m not ready to give it final judgment yet. I know that on my system, at least, it’s been quite well-behaved, outside of some peculiarities with mouse control. I’ll lose the cursor occasionally in Windowed mode, and not be able to get it back unless I switch to a different application. I also know that a few readers here at Macworld and posters to the EVE Online forums are having a bit of trouble. But one way or the other, I don’t expect that any of this represents a show-stopper that means you shouldn’t at least download EVE for yourself and give it a try. Just bear in mind that EVE does require an Intel-based Mac with a non-integrated graphics chip. That means that if you’re using a MacBook Pro, Intel iMac or Mac Pro, you’re probably okay—but MacBook and Mac mini users might have some trouble. I plan to follow up this first look with a more complete review once I’ve really had a chance to put EVE Online through its paces. For now, however, I strongly recommend that MMOG players who have had enough of World of Warcraft and gamers looking for the logical successor to Elite and Escape Velocity should check out EVE Online, post-haste. You can download a 14-day free trial that doesn’t require a credit card to activate. After that, EVE will cost you $19.95 for the first month, and $14.95 for each month thereafter. And if you’re hooked right away and want to save yourself some money, make sure to check out the EVE Online store where you can purchase game cards.